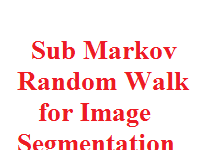 A novel sub-Markov irregular walk (subRW) calculation with name earlier is proposed for seeded picture division, which can be translated as a customary arbitrary walker on a chart with included helper hubs. Under this clarification, we bind together the proposed subRW and other prevalent arbitrary walk (RW) calculations. This binding together view will make it feasible for exchanging inborn discoveries between various RW calculations, and offer new thoughts for outlining novel RW calculations by including or changing helper hubs. To check the second advantage, we outline another subRW calculation with name preceding tackle the division issue of items with thin and stretched parts. The exploratory outcomes on both manufactured and characteristic pictures with twigs show that the proposed subRW technique beats past RW calculations for seeded picture division.